Hi Peeps, Got entrapped by an idea someone asked about in backdrop frames. Came up with these! I've called them "overline" and added a folder to Frames in my Bazaar. Hi Di. They are lovely. However, being a guy I guess, I have no idea what a "backdrop frame" is, or how it should be used. Sorry for my ignorance. 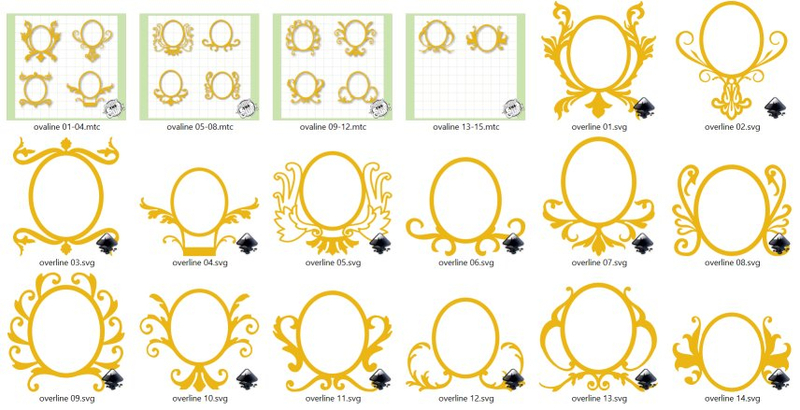 Sorry they are frames for adding floral or other decorations to - so that they become 3D and special. A bit like a frame for a wreath. Bob at CraftsUPrint from the UK has been providing templates to make cards like the above for many years. They are print and cut, although the majority is traditionally done by fussy cutting the pieces. They are lovely...you'd have to make a lot of cards and sell them for it to be worth $25 to buy that above kit. I would never make money, I tire of repetitive tasks very quickly . I do love the Heartfelt products, my local scrapbooking store loves their products too. Di-lite please do! They would be lovely!